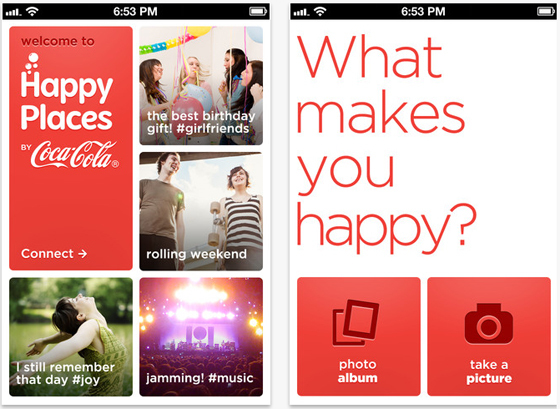 Coca-Cola launches a photo app and social network called Happy Places, with the angle that photo sharing is more about sharing happy moments. The emphasis is therefore on the emotional content and context of the photo. I think it is an interesting concept, but it may lack richness with the mere emphasis on ‘happiness’. Coca-Cola has long made happiness part of its brand DNA. Now extending that joy into social, the iconic brand‘s Happy Places photo app and social network is encouraging people to share their happy moments with a new photo-sharing social network, Happy Places, and a free mobile app to enable it. The launch comes as Twitter is rumored to be ready to launch a photo filter, a move that Instagram’s CEO says doesn’t scare him. Users can view and comment on otherâ€™s pictures and follow hashtags like #music, #joy and #girlfriends to keep up-to-date with new uploads that fit with these “moments.” A earlier version of the app was released for Android and BlackBerry devices.